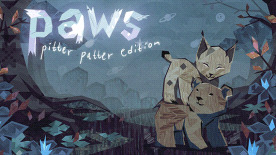 Paws: Pitter Patter Edition comes packed with the full Paws base game, the soundtrack as well as a new interactive book dubbed The Lonesome Fog. Might and Delight invites you to step into the world of Shelter 2 in a standalone adventure set in a fairytale world. This is Paws! Dark and grime, twist through the vines Slip through perils with finesse and toil Be two for strength, be two of mind Find the way home to familiar soil. The game combines all the unique elements from the much loved Shelter series to present a lovingly crafted story about loss, friendship and the search for lost love. Comes with Paws base game, the OST and The Lonesome Fog interactive book.